A visually rich necklace, constructed on golden ruched silk from Turkey. 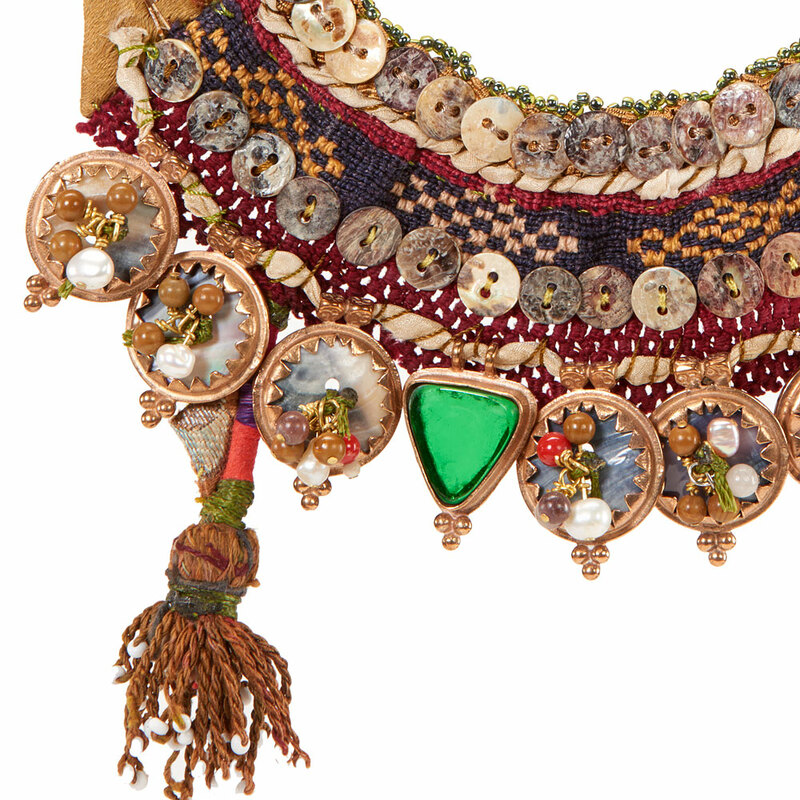 It display and interesting array of mother of pearls bottoms, and a unique handmade Turkmen embroidery in blue. A series of round elements crowned with little stone bunches mark the lower contour. Add a lonely tassel on the right side and VOILA ! an unforgettable necklace to wear with jeans or a taylor suit. MEASUREMENTS : from clutch to the end of the necklace 8″. The circumference for the neck has 5 ” in diameter. The necklace has two bottoms to adjust it for a slimmer neck. 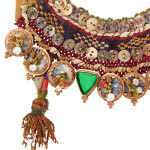 ARTIST BIO: the lady who makes these necklaces is a Turkish retired artist that likes to combine elements from the Turkmen culture , like fabric triangles that are used in all their textiles and which seem to be given to power to bring luck or good spirits to any textile that display them, with bottoms, embroideries and ottoman elements. 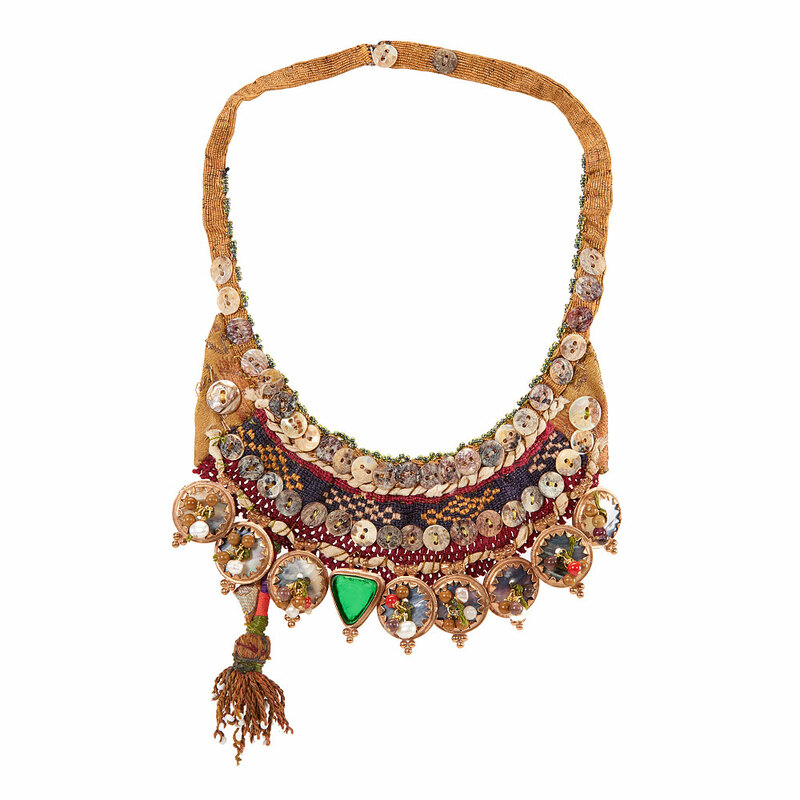 She has a very central Asian view of decoration, where the profusion of these elements create a sense of uniqueness. She also believes deeply in asymmetry: her reason is the conviction that we are all unbalanced creatures, so necklaces should reflect this unevenness.